Think Tank is a continuing education program (AIA CEU HSW) that travels to leading architecture and design firms throughout North America. Metropolis Publisher/Editor in Chief, Susan S. Szenasy, known for her provocative but supportive moderating style, leads conversations, focusing on The Human Factor: In Search of Human-Centered Design. Our Think Tank challenges experts in design — architects, interior designers, manufacturers — to examine the strengths and weaknesses of current design-thinking and building within the areas of: Education, Workplace, Wellness, Hospitality and Urban Design/Mixed-Use. Think Tank is a continuing education program (AIA CEU HSW) that travels to leading architecture and design firms throughout North America. Metropolis Publisher/Editor in Chief, Susan S. Szenasy, known for her provocative but supportive moderating style, leads conversations, focusing on The Human Factor: In Search of Human-Centered Design. 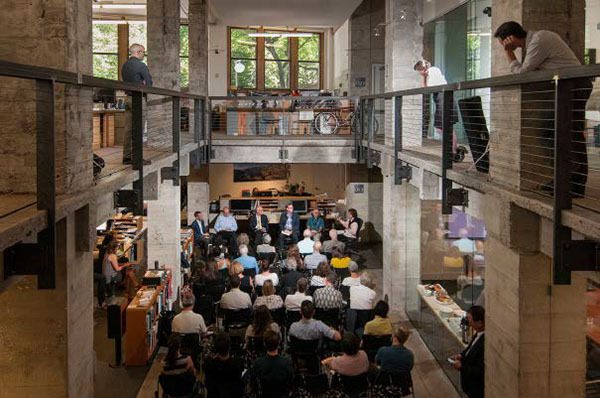 Our Think Tank challenges experts in design — architects, interior designers, manufacturers — to examine the strengths and weaknesses of current design-thinking and building within the areas of: Education, Workplace, Wellness, Hospitality and Urban Design/Mixed-Use.